These pages are being updated to be your one-stop shop for all of the many things that there are to do in Earl Shilton. For now, please use the drop-down menu to look at information about our parks and about the clubs, groups and activities available in Earl Shilton. Operating times to be published by Funfair. To mark the 50th anniversary of 'Butch Cassidy and the Sundance Kid' being released, this year's annual Picnic in the Park takes a Country & Western theme. Details of entertainers and activities will follow shortly. Shilton goes to the Seaside. 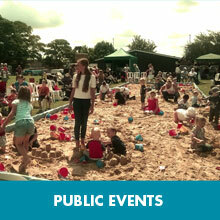 - with activities to entertain at Wood Street Park. Details to follow. NB Road closure will be in operation.